Simon Reynolds at digitalspy.com offers six video links to classic scenes from the great James Bond film Goldfinger. There's a strong argument that Goldfinger, Sean Connery's third outing as Ian Fleming's secret agent, is the first true 'James Bond Movie'. 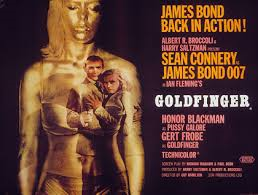 Where Dr No and From Russia with Love were low-key spy thrillers, Goldfinger pushed the series to the next level with its belter of a theme song, eccentric villain/sidekick combo, and introduction of high tech gadgets. Note: Goldfinger is my second favorite James Bond film. From Russia With Love is my favorite.